JK Rowlings endorsement of the Bana Project is a completely different matter, as she is underwriting a fraud, perhaps the most blatantly fake of a number of propaganda projects designed to engender support for the UK-supported war on Syria, is bizarre. She is also an accomplice, if unwitting, to child exploitation and abuse (see The Crucifixion of Bana Alabed). 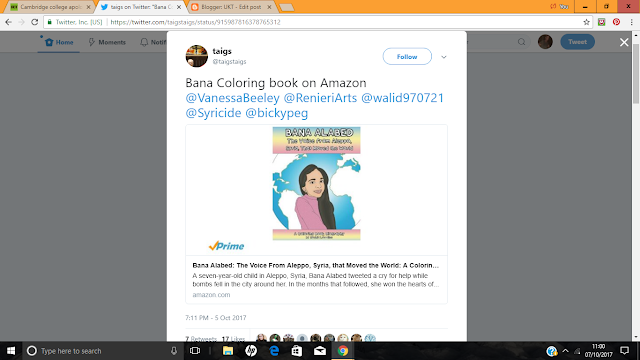 At the height of the campaign to take Aleppo back from al Nusra, “seven year old Bana”, more probably a 29 year old based in London, was ostensibly tweeting to urge the world to impose a Libya-style no fly zone. Bana is also known to be daughter of syrian FSA jihadist militiamember Ghassan Al-Abed & clearly not an unbiased messenger in this conflict. More brainwashing, #WhiteHelmet& #BanaAlabed colouring books..teaching children to love #AlQaeda.